The adoption and implementation of the Common Core State Standards and Smarter Balanced assessments in mathematics are intended to provide all students in California with the knowledge and skills required to transition from high school to college-level coursework. This implementation will take time. 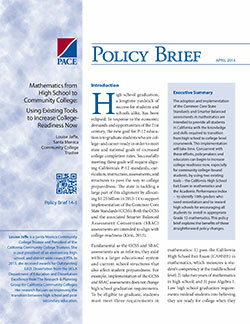 Concurrent with these efforts, policymakers and educators can begin to increase college-readiness now, especially for community college-bound students, by using two existing tools – the California High School Exit Exam in mathematics and the Academic Performance Index to identify 10th-graders who need remediation and to reward high schools for encouraging all students to enroll in appropriate Grade 12 mathematics. This policy brief explains the benefits of these straightforward policy changes.